We’d like to thank Brian for sharing today’s story. After reading other people’s Bill Murray stories for years and years, growing greener with jealousy after each one, I finally get to write one of my own. This took place at the 2015 John Deere Classic. I’m a huge fan of Bill and have wanted to meet him since I was a kid. Me niece and I got up around 4am and headed towards the JDC. I’d checked the place out the day before, learning the lay of the land and determining where Bill would tee off and what not. The staff was great and it seemed simple enough. We arrived at the course around 6:30am and quickly made our way to the driving range and practice putting green where the players warm up. Bill’s tee time wasn’t until 8:45am so we were the only ones waiting for him when we arrived. 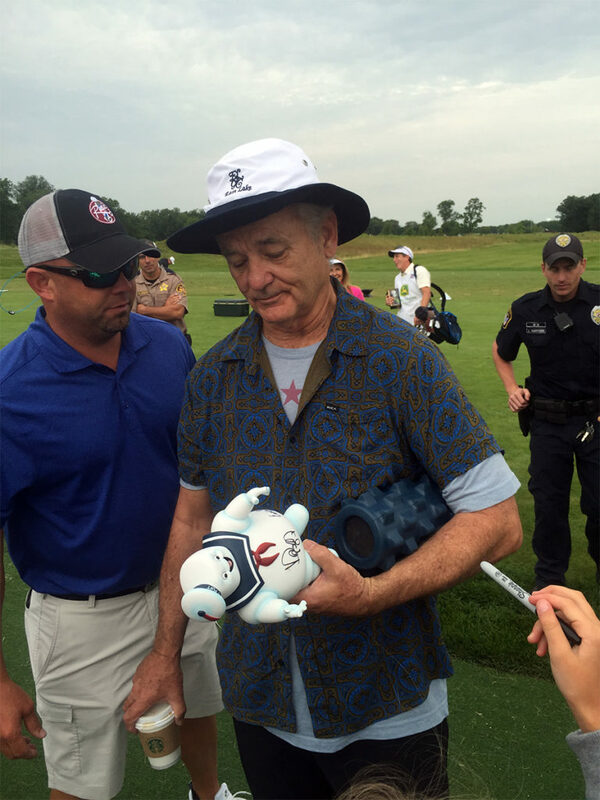 My niece was armed with my 12″ Stay Puft Marshmallow Man (already signed by Dan Aykroyd and Ernie Hudson) so the course staff kept stopping us to inquire about this odd item. She was a champ and told everyone what her mission was. Me? Well I had my Ghostbusters 8×10 (also previously signed by Dan and Ernie) with me but was not expecting to even try to get an autograph; my goal was to get a picture with Bill where he was actually looking at the camera. For most celebrities, this would be very easy but Bill’s legendary reputation for being difficult had me convinced it wouldn’t actually happen. By 7:30am, we had seen some pro players warm up and every course staff member in the vicinity knew who my niece was at this point. It was the perfect scenario and she was loving the attention. Still no sign of Bill, tho, and a few other folks had come to greet him when he arrived. My confidence was still very low. Around 8am, I looked up and there he was. Bill Murray was about 20 feet in front of us, on the other side of the small fence, just standing there. He was wearing a signature floppy hat and the same funky clothes he had on a few nights ago at the Grateful Dead concert. For a split second, I considered hopping the fence; I was that excited. I may have literally jumped up and down once or twice. I pointed him out to my niece who immediately held the marshmallow man in the air as high as she could. As Bill turned around, he remarked, “Nice, kid” and headed toward his tee on the driving range. His tee was quite a ways down the range so we raced to the corner right behind him and planted ourselves firmly in front of the fence. Within minutes, a large crowd began to grow behind us. While he was warming up, many of the other golfers approached him for autographs and pictures. He was only about 30 feet away so we could hear everything he was saying; he was in a good mood. My niece had that marshmallow man in the air like her life depended on it and I was just standing there with my jaw on the ground; I was looking at Bill F*&amp;%in’ Murray! Some of the other people behind us remarked that every time he turned around to talk to people, he kept glancing at the marshmallow man my niece was holding. I had seen him do it, too, but wasn’t about to get my hopes up. After about 15 minutes of warm up, Bill put his clubs away and started to walk towards us, stopping to talk to some people. I was afraid he was going to bolt out the secure exit from which he had arrived so I told my niece to yell his name. Her little voice yelled, “Bill!”. Nothing. She tried again. Still nothing. On the third try, he finally looked her way, saw the marshmallow man for sure, and jokingly said’ “Don’t yell at me, kid!” She laughed and he started walking our direction. I was shaking. Literally shaking. Before I continue, I’ve gotta make a comparison here. As a guy, I remember the first time I ever hooked up with a girl. There was that sense of anticipation; hoping it would happen but not knowing for sure if it would. Like a giant game of cat and mouse. I do this, she does that, and maybe I’ll get lucky. That’s what it felt like as Bill was walking towards us. Years and years of anticipation was about to culminate in this one moment. Absolutely surreal. So Bill gets to the fence and acknowledges the marshmallow man. “That thing has a lot of autographs on it; it must be worth a fortune“, he says. With coffee in one hand, he took the marshmallow man with the other. My niece politely asked him to sign it but he wasn’t yet ready. “Who you got here? Dan and Ernie?”, he asked regarding the autographs. My niece told him he was right and said she needed him to complete it. Nope, not yet. “Oh, it’s a bank, too. Nice. I’ll tell you what, this is pretty cool; I’ll give you $10 for it right now“, Bill joked. My niece quickly shot back, “No way” and held out her Sharpie. Finally, he handed the coffee to one of the cops who was flanking him, pulled off the Sharpie cap with his teeth, and began signing the marshmallow man. What was I doing up until now? Standing there like an idiot. Not believing what was happening. Finally, I had the presence of mind to get my phone out. I told my niece to turn around and smile and I snapped a pic of her with him signing the marshmallow man. As he was finishing up, I began to take a selfie and asked if I could do so. He slammed me for saying, “CAN I take a selfie”. I’d made a grammar mistake. 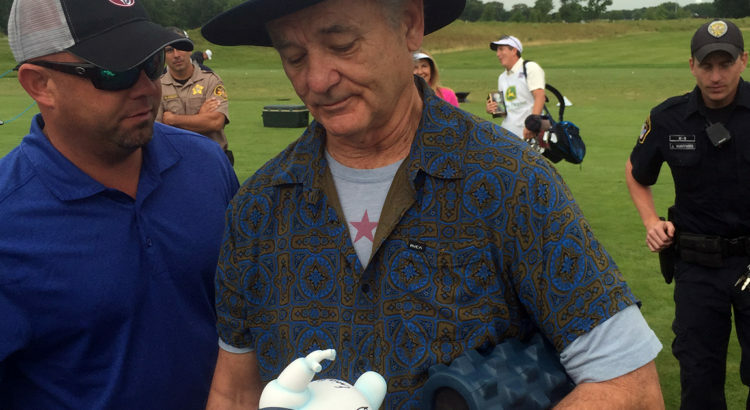 Here’s a tip: don’t do that with Bill Murray. He will light you up. And in front of about 100 people, to boot. “CAN you take a selfie? I dunno, can you?“, he quipped. I quickly corrected myself but he wasn’t done. “You might be able to but I’m doubting your ability to.” The entire crowd was laughing and he finally looked at the camera and said, “Take your picture”. I did. As I turned back around, about a dozen hands came over me from the people behind us, all shoving things in his face to sign. I wasn’t about to try for my Ghostbusters pic at this point. He looked up into the crowd and, seeing another child, said “Oh, ok, you’re a kid so I’ll sign for you”. And he did. I then held out my hand, he shook it, my niece thanked him, and he was gone. The whole exchange lasted about 90 seconds but we had done it: I had a picture and an autograph. As soon as he left, so did the crowd. My niece and I were left there and the local news immediately approached us and asked my niece if they could talk to her. She looked at me, not fully understanding what they wanted, and I explained that they wanted to interview her for the nightly news. She was thrilled and gladly complied! I captured the entire interview on my phone for her mom; she did very well! Moving on, as we were walking away from the driving range, my niece asked if Bill was actually going to play golf. I told her that he was and that he was getting ready to tee-off. After explaining what tee-off meant, she reminded me that I hadn’t gotten my Ghostbusters picture signed. I told her that it was OK; I was just happy with a picture. Besides, he signed my marshmallow man and that was good enough for me. She wasn’t having it, tho, and suggested we try again. I was game, of course, so we wandered to the first hole where he was prepping to start his round. There were people EVERYWHERE and there was no way we were going to get close. So I suggested we walk to the green of the first hole and wait. We walked along the beautiful course to the green where no one was waiting but a tournament official. The group ahead of Bill’s was just finishing the hole and we were able to see where the official lowered the rope surrounding the green to let them pass onto the next hole. We planted ourselves at that exact point and waited. A few minutes later, a stampede of people turned the corner, following Bill’s group. We were in the spot everyone wanted and weren’t gonna move. We watched as Bill joked with his partners, with the crowd, and hit a good shot out of the trap. After he putted it in, Bill grabbed his ball and security came towards us to create a path before lowering the rope. We were still right in front as Bill began walking over. I handed my niece my picture and Sharpie, she held it out, and asked him to sign it. Bill quipped, “This is number 2. You’re doing very well, kid. Of course I will sign it, as you requested” and laughed. I was snapping pics as all this was happening. We thanked him, he signed one other guys golf flag, and said he “had to keep moving so he didn’t hold up the next group”. And with that, he was gone again. I couldn’t have asked for a better experience. Fulfilling a goal that I never thought was possible was amazing and see Bill up close was more fun than I had ever imagined.